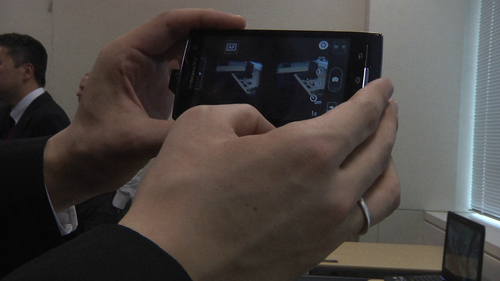 Fujitsu has developed a system that allows standard mobile phone cameras to take 3D pictures and video. The company has designed a small attachment about the size of a stick of lip balm that lies flat across the mobile camera, using a tiny set of mirrors to split an image or video recording into two parts. These parts are then uploaded to a server operated by Fujitsu, which aligns the two halves into a single 3D picture or video. "The heavy processing is carried out in the cloud. This means that there is no need for dedicated software or chip hardware in the smartphone. This technology allows for capturing 3D images using everyday smartphones or feature phones," said Teruyuki Sato, a researcher at Fujitsu Laboratories. Some phone makers, including HTC and Sharp, have released handsets with the ability to shoot 3D images, but these have included dedicated hardware such as dual cameras. The image processing required to match up two separate images to create a single 3D photograph can also be taxing for a small device, Sato said. Fujitsu is giving away the attachments and providing free access to its image processing servers through June as part of a campaign to test the system. Details, in Japanese, are available online on a page hosted by domestic portal Nifty. The service produces 3D videos viewable on standard 3D TVs. Fujitsu said it will present the technology behind the new system at the International Symposium on Consumer Electronics (ISCE), held from June 4 to 6 in Harrisburg, PA. The symposium is held by the Institute of Electrical and Electronics Engineers (IEEE).